Today day care training is our most popular program and consistently produces excellent results. In 1975 the concept of day care dog training was unheard of. Carlos and Sandy had worked in boarding and training facilities and knew there had to be a better way to accomplish professional training results while still including the owners. With this in mind they founded the day care training program. Today day care training is our most popular program and consistently produces excellent results. Consequently, it is usually booked well in advance. However, most owners feel that the education they receive is worth the wait. All training takes place in historic Old Town Alexandria where a dog in day school will spend the day visiting our local parks, shops, and walking down King Street and through Market Square. Dogs are trained for a minimum of 30 minutes three times a day, four days a week for three weeks. Your dog will attend school Tuesday through Friday. 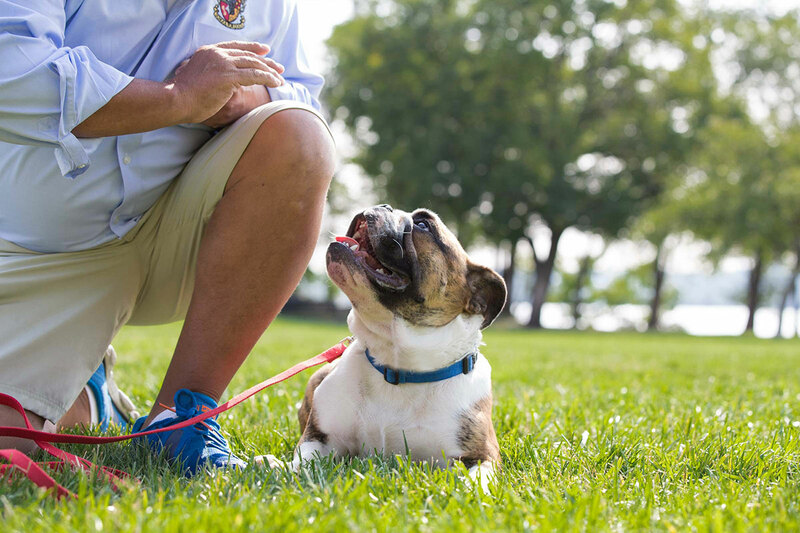 Owners receive three one-hour private sessions to see their dog's progress and learn how to use what their dog has learned. After the first lesson you are an active participant in the program with your dog. Handling lessons are usually given at the end of each week the dog is in school. Exercises covered in our basic course include heel and sit automatically when you stop, sit-stay, down-stay, come when called and down from a distance. Your dog will work on both a six foot and fifteen foot leash and is expected to work around distractions such as other dogs, traffic, squirrels and joggers. We also teach you how to use your training tools to work with problems such as barking, jumping, digging or destructive behavior. All graduates receive a diploma and an "honor student" bumper sticker. We work with several excellent dog taxi services if your dog requires transportation. Day School is in session from 9 am to 4 pm but dogs are welcome to arrive as early as 7:30 am and can be picked up as late as 7:00 pm.